3M 1100 UF Foam Ear Plugs (NRR 29) (Box of 200 Pairs)5Concrete StreetOctober 16, 2014Great ear plugs at a great price. Love that they are individually wrapped !!! 3M 1100 UF Foam Ear Plugs (NRR 29) (Box of 200 Pairs)5JackieJanuary 14, 2013These are the best ear plugs I have found. I used the E.A.R plugs for years but they are not as good as these. I can use the same pair for days before I need to replace them. They are comfortable too. The best. 3M 1100 UF Foam Ear Plugs (NRR 29) (Box of 200 Pairs)5OlivierJanuary 8, 2013Finally, an ear plug that feels comfortable and does not cause unbearable itching even after several hours riding my motorcycle. Sound attenuation is very good, too. 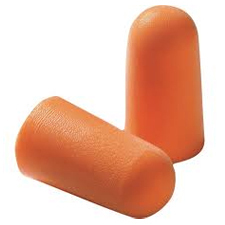 As a long distance motorcycle riders, I have tried LOTS of other ear plugs, but for my needs, these come on top by a great margin. 3M 1100 UF Foam Ear Plugs (NRR 29) (Box of 200 Pairs)4WayneSeptember 22, 2012Good earplug at a reasonable price. I reuse these about 5-7 times before I notice they aren't blocking as much noise as the first time. Individually wrapped so no special dispenser required. The only better plug I've used is the longer, larger plugs for larger ears! 3M 1100 UF Foam Ear Plugs (NRR 29) (Box of 200 Pairs)5GeorgiosJuly 20, 2012Great price. Fast shipment.excellent ! Thanks! 3M 1100 UF Foam Ear Plugs (NRR 29) (Box of 200 Pairs)5GeorgiosNovember 4, 2011Great price. Fast shipment ,great transaction. 3M 1100 UF Foam Ear Plugs (NRR 29) (Box of 200 Pairs)5PMAugust 17, 2011Works great and is comfortable. Great deal on price will buy my next box here. 3M 1100 UF Foam Ear Plugs (NRR 29) (Box of 200 Pairs)5JCMay 13, 2011I have used the 3M 1100 foam plugs for almost 20 years and prefer them to any other foam plug I have tried. I use and recommend them without hesitation. 3M 1100 UF Foam Ear Plugs (NRR 29) (Box of 200 Pairs)5GLMarch 7, 2011Works great and is comfortable.